The Akashi-Kaikyo Bridge in Japan , also known as Pearl Bridge , is the longest suspension bridge in the world to date. The bridge crosses the Akashi Strait ; it links Maiko in Kobe and Iwaya on Awaji Island as part of the Honshu--Shikoku Highway . As measured by the length of its center span (6,532 ft), the bridge is substantially longer than the second longest suspension bridge, the Eastern Bridge (5,328 ft) of the Danish Great Belt Fixed Link. The total length of the Akashi-Kaikyo Bridge is 12,831 ft. It was planned to be one of three Honshu--Shikoku connecting bridges, annexing two borders of the Inland Sea . Before the Akashi-Kaikyo Bridge was built, ferries carried passengers across the Akashi Strait . This dangerous waterway often experiences severe storms, and in 1955, two ferries sank in the strait during a storm, killing 168 children. The ensuing shock and public outrage convinced the Japanese government to draw up plans for a suspension bridge to cross the strait. Construction on the bridge began in May 1988, and the bridge was opened with six lanes of traffic on April 5, 1998. Our sin has caused a GREAT SEPARATION from God: “Your iniquities have separated you from your God; And your sins have hidden His face from you, So that He will not hear” (Isaiah 59:1-2). 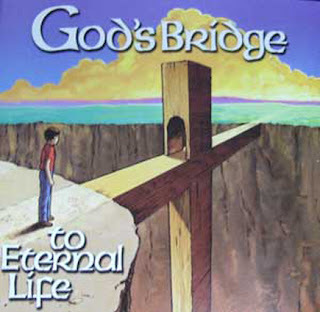 Many “bridges” have been built to try to span the distance between sinful man and a holy God. * Some have tried to reach God through good works. This bridge is far too expensive! Although important, one cannot do enough good works to EARN one’s way to heaven (Eph 2:8-10). * Some have sought to bridge the gap to God by living good, moral lives. This bridge just isn’t long enough. Being good isn’t good enough, for even at our best, we still FALL SHORT (Rom 3:23). The ONLY Bridge by which we can reach God is through His Son, Jesus Christ. Jesus said, "I am the WAY, the TRUTH, and the LIFE. No one comes to the Father except through Me” (John 14:6). Jesus spanned the gulf between man and God by dying on the cross for the sins of the world (1 John 2:2). Dear Lord, thank You for being the bridge that we need. Help us share the way to those that come into our path today. In the Name of Jesus, Amen.